Dance in China is a highly varied art form, consisting of many modern and traditional dance genres. The dances cover a wide range, from folk dances to performances in opera and ballet, and may be used in public celebrations, rituals and ceremonies. There are also 56 officially recognized ethnic groups in China, and each ethnic minority group in China also has its own folk dances. Outside of China, the best known Chinese dances today are the Dragon dance and the Lion dance. A Tang Dynasty dancer from a mural unearthed in Xi'an dancing with a shawl. There is a long recorded history of various forms of dance in China. The earliest Chinese character for "dance", , written in the oracle bones, is itself a representation of a dancer holding oxtails in each hand. Some Chinese dances today such as dancing with long sleeves have been recorded since the very early periods, dating from the at least as early as the Zhou Dynasty. The most important dances of the early period were the ritual and ceremonial music and dances called yayue, and these dances were performed at the imperial court until the Qing dynasty, but only survive today as performances in Confucian ceremonies. The imperial court from the Qin dynasty onward established various departments responsible for the collection of music and dances, training of performers as well as their performances at the court, such as the Music Bureau and Royal Academy. During the Six Dynasties era (220 - 589 CE), there were strong influences from Central Asia in music and dance. The art of dance reached a peak in the Tang Dynasty, and the dances of the period were highly diverse and cosmopolitan, dances from Central Asia in particular were popular. A great number of dances were recorded in the Tang dynasty, for example there are over 60 Grand Compositions alone which are large scale performances from the Tang court, and there were tens of thousands of musicians and dancers at the Imperial palaces. The art of dance however declined after the Tang dynasty. This is due in part to the increasing popularity of the practice of footbinding, which may have first arisen from dancers themselves but later tighter binding limited their movements, and greater social restriction placed on women may have also led to a virtual elimination of female dancers. Furthermore, dance was absorbed into Chinese opera that started to take shape in the Song dynasty and became increasingly popular and further developed in the following dynasties, and dance as a separate performance art largely survives in folk traditions. In more recent times, the art of dance in China has enjoyed a resurgence, and modern developments in Chinese dances are continuing apace. Many of the traditional dances have a long history. These may be folk dances, or dances that were once performed as rituals or as entertainment spectacle, and some may have been performed in the imperial court. Among the best-known of the Chinese traditional dances are the Dragon dance and Lion dance, and both dances were known in earlier dynasties in various forms. A form of lion dance similar to today's lion dance was described as early as the Tang Dynasty, the modern form of the dragon dance however may be a more recent development. In some of the earliest dances recorded in China, dancers may have dressed as animal and mythical beasts, and during the Han Dynasty, some forms of the dragon dance were mentioned. The Dragon dances of Han Dynasty however do not resemble modern form of the dance. Dragon dances mentioned include a dance performed during a ritual to appeal for rain at time of drought as Chinese dragon was associated with rain, acts in the baixi variety shows where performers dressed up as a green dragon playing a flute, and acts where fish turned into a dragon. Modern Dragon Dance uses light-weight structure manipulated by a dozen or so of men using poles at regular intervals along the length of the dragon, and some forms of the dragon can be very long and involve hundreds of performers. There are more than 700 different dragon dances in China. The Lion dance has been suggested to have been introduced from outside China as lion is not native to China, and the Chinese word for lion itself, shi (獅), may have been derived from the Persian word šer. Detailed description of Lion Dance appeared during the Tang Dynasty and it was then recognized as a foreign import, but the dance may have existed in China as early as the third century AD. Suggested origin of the dance include India and Persia, and during the Northern and Southern Dynasties it had association with Buddhism. A version of lion dance resembling modern lion dance was described by Tang poet Bai Juyi in his poem "Western Liang Arts" (西凉伎), where the dancers wear a lion costume made of a wooden head, a silk tail and furry body, with eyes gilded with gold and teeth plated with silver, and ears that moves. There are two main forms of Chinese Lion Dance, the Northern Lion and Southern Lion. A form of the Lion Dance is also found in Tibet where it is called the Snow Lion Dance. Folk dances are important historically in the development of dance in China, some of the earliest dances in court rituals and ceremonies may have evolved from folk dances. Rulers from various dynasties collected folk dances, many of which eventually became court dances. However, at various times there had also been antipathy towards some folk dances and some emperors attempted to ban them. Many of the folk dances are related to harvest and hunting and the ancient gods associated with them. For example, the Constellation Dance was performed to procure as much seed grain as there are stars in the sky, while the Harpoon Dance was associated to Fuxi who according to the mythology gave the Han people fish net, and the Plough Dance was connected to Shennong, the god of agriculture. Yangge - a dance that is common in Northern China. Lantern Dance - a dance found in Southern China. Folk dance from a minority group in China. Mongolian Bowl Dance (頂碗舞) - a dance where female dancers balance several bowls on their heads while dancing. Long Drum Dance (長鼓舞) - a dance of the Yao people which inspired the orchestral composition Dance of the Yao People. Sanam - an Uyghur dance. Dance as part of the Peking Opera in a performance of "Heavenly Lady Scatters Flowers" (天女散花). In the entertainment centres called wazi during the Song Dynasty, various theatrical forms flourished and Chinese opera began to take shape, and dance started to become merged into opera. Dances such as "Dance Judgement" (舞判, also called the Dance of Zhong Kui, 跳鐘馗) became opera pieces in the Ming Dynasty, and dances of the Song Dynasty such as Flapping the Flag (撲旗子). Other dances found in opera include the Sword Dance. Chinese opera became very popular by the Yuan Dynasty, and dances became absorbed into opera over the following centuries. Most early records of dances in China were ritual or ceremonial dances, and these dances formed the yayue which were considered to be of great importance in the court. These dances have largely disappeared from modern Han Chinese culture, although ritual dances are still found in some folk traditions and the cultures of ethnic minorities in China. Yi Dance (佾舞, literally "row dance") was originally a court dance, but adopted to form part of a Confucian ceremony. This ancient dance may be performed with rows of dancers holding pheasant feathers and red flutes in a square formation (Civil dance) or they may hold a shield and a battleaxe (Military Dance). The tradition of dancing holding items such as feather plumes dated back to Shang Dynasty. The most important ceremony is performed with 8 rows of 8 dancers (the Eight Yi Dance, 64 dancers in all). Originally dances were only performed in 6 rows of dancers (36 dancers in all) in Confucian temples as 8 rows were restricted to the Imperial court, but permission was later granted to perform the 8-row dance as well on the basis that he was given the title of a king by an emperor. Modernized version of such performances are presented for tourists at the confucian temple in Qufu. This confucian dance is also performed in Taiwan and Korea. Nuo Dances (儺舞) - a dance with masks which may be performed in Nuo opera or as rituals during festivals to drive away evil spirits. According to Lüshi Chunqiu, during the time of Emperor Yao, a dance was created as an exercise for the people to keep healthy after a prolonged spell of wet weather. Traditionally some Chinese dances may also have connection with the martial arts that were used to train fighting skills as well as for fitness, and some martial art exercises such as Tai chi or Qigong are similar to a choreographed dance. In modern China, it is common to find people using dance as a form of exercise in parks. 1972 production of The Red Detachment of Women by the National Ballet of China. The first ballet school in China, Beijing Dance School, was established in 1954 with Dai Ailian as the principal and staffed by some outstanding Russian teachers, including Pyotr Gusev who instituted the Russian training system. In the following years ballets such as Swan Lake and Romeo and Juliet were performed. The National Ballet of China was founded on the last day of 1959 as the Experimental Ballet Company of the Beijing Dance School. During the Cultural Revolution under the control of Madame Mao, Revolutionary Model dramas came to the fore, and the repertory was eventually reduced to two ideological ballets - The Red Detachment of Women and The White Haired Girl. After the fall of the Gang of Four, the ballet company began to reform and change direction with the classical Western ballets resurrected, and also broadened its range to include more modern ballets from around the world. Modern choreography on traditional themes - this one is based on paintings and sculpture of Thousand Hand Guanyin. 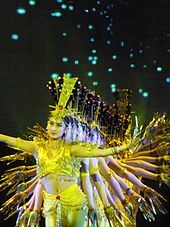 Many dances presented as traditional in theatres and television are modern imagination of ancient dances using modern choreography, for example the famous Rainbow-Feathered Dress Dance of the Tang Dynasty. Dunhuang dance - modern composition inspired by frescos from Dunhuang caves. Western ballroom dancing became popular in the 20th century, previously it would not have been permissible for men and women from respectable families to dance together. It was popular in the 1940s Shanghai nightclubs, and early Communists leaders such as Mao Zedong and Zhou Enlai were also avid Soviet-style ballroom dancers. Ballroom dancing however later disappeared after the Cultural Revolution to be replaced by massive group dances such as yangge dance. Ballroom dances however reappeared after the liberalisation of China later in the century, and it is now commonly found performed by many people in public parks in the morning as exercise. ^ Wang Kefen (1985). The History of Chinese Dance. China Books & Periodicals. p. 7. ISBN 978-0835111867. ^ Dillon, Michael (24 February 1998). China: A Historical and Cultural Dictionary. Routledge. pp. 224–225. ISBN 978-0700704392. ^ China: Five Thousand Years of History and Civilization. City University of Hong Kong Press. 2007. p. 458. ISBN 978-9629371401. ^ Anders Hansson (1996). Chinese Outcasts: Discrimination and Emancipation in Late Imperial China. Brill. p. 46. ISBN 978-9004105966. ^ Lihui Yang, Deming An (2008). Handbook of Chinese Mythology. Oxford University Press. pp. 107–108. ISBN 978-0195332636. ^ "《求雨》". Chinese Text Project. ^ Richard Gunde (2001). Culture and Customs of China. Greenwood. p. 104. ISBN 978-0313361180. ^ a b Janet Descutner. Asian Dance. Chelsea House Publishing. pp. 99–100. ISBN 978-1604134780. ^ Laurence E. R. Picken (1984). Music for a Lion Dance of the Song Dynasty. Musica Asiatica: volume 4. Cambridge University Press. p. 201. ISBN 978-0521278379. ^ Wilt L. Idema, ed. (1985). The Dramatic Oeuvre of Chu Yu-Tun: 1379 - 1439. Brill. p. 52. ISBN 9789004072916. ^ Berthold Laufer. Kleinere Schriften: Publikationen aus der Zeit von 1911 bis 1925. 2 v. p. 1444. ISBN 978-3515026512. ^ Mona Schrempf (2002), "chapter 6 - The Earth-Ox and Snowlion", in Toni Huber (ed. ), Amdo Tibetans in Transition: Society and Culture in the Post-Mao Era, Brill, p. 164, ISBN 9004125965, During the Persian New Year of Newruz, a lion dance used to be performed by young boys, some of the naked it seems, who were sprinkled with cold water. They were thus supposed to drive out evil forces and the cold of the winter. ^ Li Beida (2006). Dances of the Chinese Minorities. China Intercontinental Press. ISBN 978-7508510057. ^ Ba Yi (八佾) According to ancient texts, this dance should only be offered in court. Confucius once complained of one such performance in the house of a noble: "The 8 yi dance is supposed to be performed in court, if he can bear to do this, what else can he bear to do?" ^ Shigeki Kaizuka (2002). Confucius: His Life and Thought. Dover Publications. p. 134. ISBN 978-0486421391. ^ Joseph Sui Ching Lam (1998). State Sacrifices and Music in Ming China: Orthodoxy, Creativity and Expressiveness. State University of New York Press. pp. 35–36. ISBN 978-0791437063. ^ Cindy Sui (September 1, 2011). "The Melodies of the Emperors". Taiwan Today. ^ "Ancient ritual dance performed in E China". People's Daily. February 10, 2012. ^ Zhen'guo Wang, Peiping Xie (1997). Ping Chen (ed.). History and Development of Traditional Chinese Medicine. IOS Press. p. 8. ISBN 978-9051993240. ^ Garripoli, Garri (1999). Qigong: Essence of the Healing Dance. HCI. ISBN 1-55874-674-9. ^ a b c Sanjoy Roy (11 August 2011). "Step-by-step guide to dance: National Ballet of China". The Guardian. ^ Richard Gunde (2001). Culture and Customs of China. Greenwood. pp. 108–109. ISBN 978-0313361180. ^ Richard Gunde (2001). Culture and Customs of China. Greenwood. pp. 110–112. ISBN 978-0313361180. ^ Kang Liu (2003). Globalization and Cultural Trends in China. University of Hawaii Press. pp. 87–88. ISBN 978-0824827595. Wikimedia Commons has media related to Dance of China. Wang Kefen (1985). The History of Chinese Dance. China Books & Periodicals. ISBN 978-0835111867. Laurence Picken, ed. (1985–2007). Music from the Tang Court: Volume 1-7. Cambridge University Press. A yangge performance from Shanbei in Shaanxi that lasted all day. This page was last edited on 4 April 2019, at 18:24 (UTC).